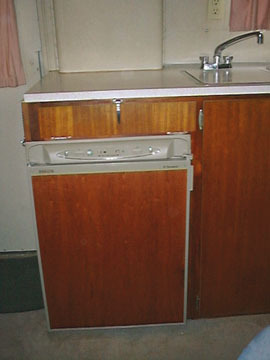 Refrigerators are durable appliances if the burner orifice and chimney are kept clean and free of misguided “adjusting”. With no moving parts, they can last forever if maintained. But even then, there are times that they need to be replaced. In the case of our original M16 Dometic, it had been cannibalized and damaged to the point that even though I was able to restore the LPG operation, the poor thing was missing so many parts that replacement became necessary. I recommend avoiding unnecessary replacement for three reasons. First, the cost – a new unit this size (Dometic RM2333) costs $750 uninstalled. Second, the newer plastic lined units just don’t have the same “soul” as the enameled steel and aluminum units of old. Third, the new units with their PC circuit boards, plastic knobs and trim and lightweight guts just aren’t going to last as long. A lastly – they just don’t fit! Almost every replacement situation requires some sort of complex “adapting”, as there are no direct one-for-one size equivalents. In this case, it was a lot of adapting. On paper, the RM2333 looked close in size, only a little taller. In reality it also became 1 1/2″ wider due to a cutout that existed on the M16 for the wheelwell. The below tour will give you some idea of what it took to perform this major operation. If I had a choice, I would always repair a unit. There are dealers who specialize in RV refrigerator repair – check your yellow pages. I’ve started a listing of dealers who can repair the older refrigerators, see below. 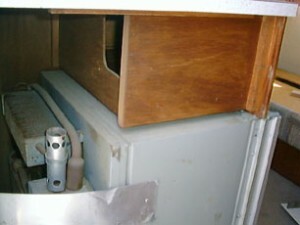 More and more companies are popping up that will repair your RV refrigerator if you deliver or ship it to them. 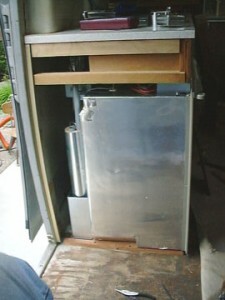 Expect to pay a lot for shipping, but saving a vintage unit or avoiding to have to modify you r trailer can be worth it. The old LPG only Dometic M16 installation. 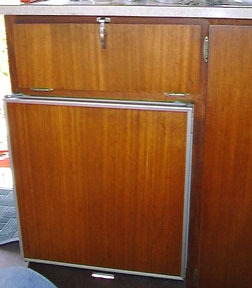 There is not a refrigerator made in this size anymore – a typical problem. With the old end panel removed, you can see the drawer casing. Showing the old unit removed and the floor and utilities prepped for the new. 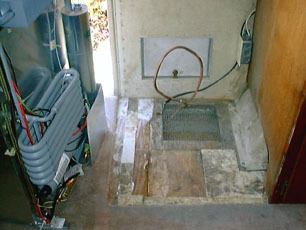 Epoxy floor repairs can be seen against the wall. The LPG line had to be repositioned and shortened since the new unit is deeper. The wheelwell that’s in the way can be seen to the right. The new 12v #10/2 wire and 110v outlet can be seen to the upper right. The 12v comes from the battery and the 110v from the circuit breaker panel. 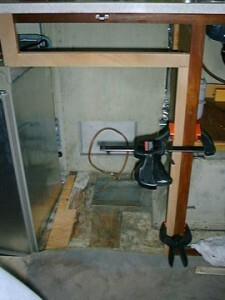 The shims required to level the unit are in place. 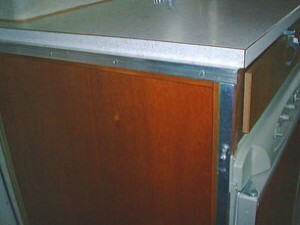 I removed the existing face frame for the old drawer and made a new one for the higher and wider opening required. Wood is mahogany, and all joints are screwed & glued. Everything in place. From right to left, the new face frame, the vertical side panel support, the plywood drawer box, and the two vertical side panel supports that tie into the relocated trim on the sidewall. It was relocated 1 1/2″ closer to the door opening, flush with the countertop edge. The new silverware drawer. I reused the old drawer pullout shelf & guide tracks and built a new box frame behind the new face frame. The bare wood from step 4 now sports a Watco Oil finish, matching the existing wood. 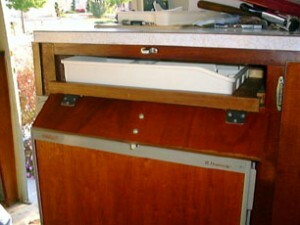 The quality of wood that Airstream had available back then is no longer around. I had to sort and pay premium prices to get plywood even close to the original grain quality for this mod. Save your old cabinet parts whenever possible, you can use the wood elsewhere, or at the very worst as templates. Always keep an eye open at garage sales, house demolitions, old hardware stores and even home centers for period materials that can used. That’s where I got the corner trim parts. LPG is the fastest way to cool down the fridge – overnight and it’s ready to freeze ice. The 110v is underused on a small trailer like this – the opportunity for shore power is rare. The 12v feature is OK if you worry about traveling with the gas on, but we find we use it only because it’s there, “I paid the extra for it, and I’m going to use it!” I wouldn’t get that option again. Be sure to check out the refrigerator section in the Restoration Resource section FAQ’s. I’ve started a listing of dealers who know how to work on older units. Let me know of any that can added to the list.